When the going market price for truffles is about $100/ounce, maybe shaving it on top of fresh tagliatelle might not fit everyone’s budget. 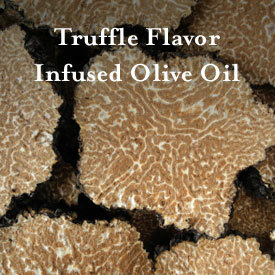 But, if you want to be just as indulgent for a fraction of the price, our new Truffle Natural Flavor Infused Olive Oil will fit the bill perfectly. Its intense aroma is so powerful, just a mere shimmer of the stuff on pasta turns it into a world-class first course. Blend it in with mashed potatoes for an unforgettable side dish or finish off that perfect cut of steak with the mysteriously addictive flavor of truffles. You’ll feel like you won the lottery. Modena, Italy is famous for traditional, cask-aged balsamic vinegars. Thick, intensely-flavored syrups, true balsamic vinegars are also a deservedly pricey condiment. Our new Superdense Balsamic Vinegars - from the same region in Italy - have a viscosity thick enough to glaze meats or drizzle over vegetables and fruit, and stand on their own to complement or contrast a dish, adding a unique twist to old recipes. Try the Superdense Hot Chilli-Infused Balsamic Vinegar drizzled over a bed of sliced jicama and beets for a wild Latin-style salad.